The summer of 2005 was a fitful one. Long, sultry days in June gave a promise of things to come, but the promise was never really fulfilled. July was not a particularly wet one; but neither was it very sunny. In East Anglia, we awoke again and again to gloomy cloud and a kind of ineffectual drizzle that eventually petered out, the clouds breaking; but the days never warmed up, and all too soon evening closed in. 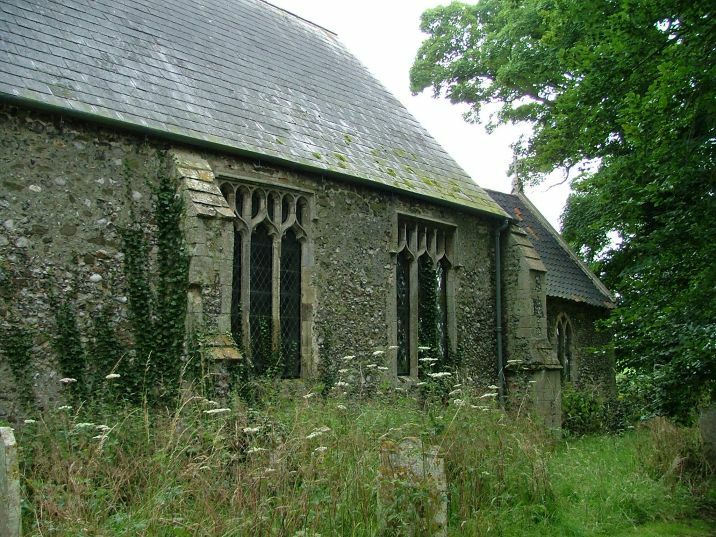 By early August, the hedgerows were still as green as they had been six weeks previously, and the conservation areas of graveyards had become jungles. There was an illusion that the summer was still held in suspense; but already, the barley and wheat fields were being harvested, the lanes clogged by mud from combines and tractors, the signs all around of everything being 'safely gathered in'. The evenings became cooler, the horse chestnuts began threatening to turn. Soon, it would be time for back to school promotions in the town shops, and the excitement of posters for harvest suppers on village noticeboards. Soon, it would be autumn. But all that was in the future. In the first few days of August, the low cloud began to retreat, and there were high skeins of it shredding above the rolling hills south of Cromer. Too early in the day to take advantage of it, we headed under overcast skies through tiny lanes banked up with green hedges. All the roads were narrow, and it seemed impossible that we were less than two miles from the nearest A road, less than six miles from Cromer, less than two hundred miles from central London. The fields were silent, the stillness in the air timeless. Through the high banks we twisted, eventually coming out into the deep cut village of Metton; barely a hamlet really. A few council houses straggled beside the church; there were some larger, older houses to the east, and a farmer had cut a maze through his crops for children to run wild and freely in. We could hear their shouts from the churchyard. It was a lovely place to be, at once ancient and yet full of young life. 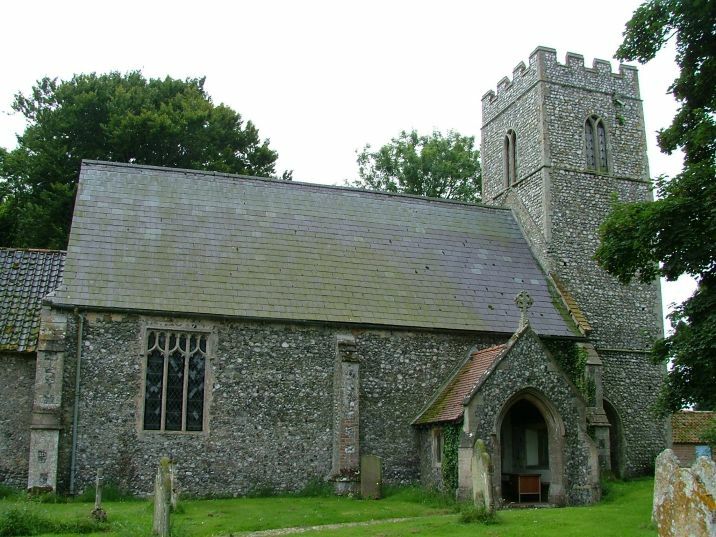 St Andrew is a simple, aisle-less 14th century church, heavily Victorianised with the introduction of late medieval-style window tracery; the high pitched nave roof rather overwhelms it all. 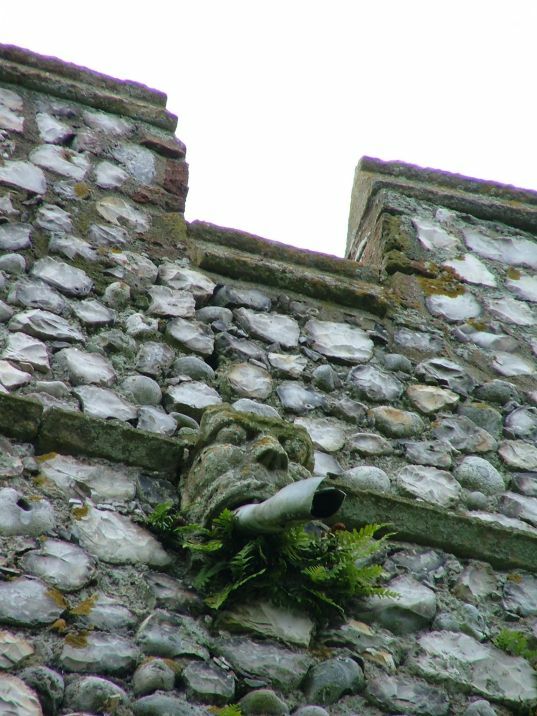 As often in this part of Norfolk, refurbishing of the flint has been a cheap option, and that seems to have happened on the tower here. 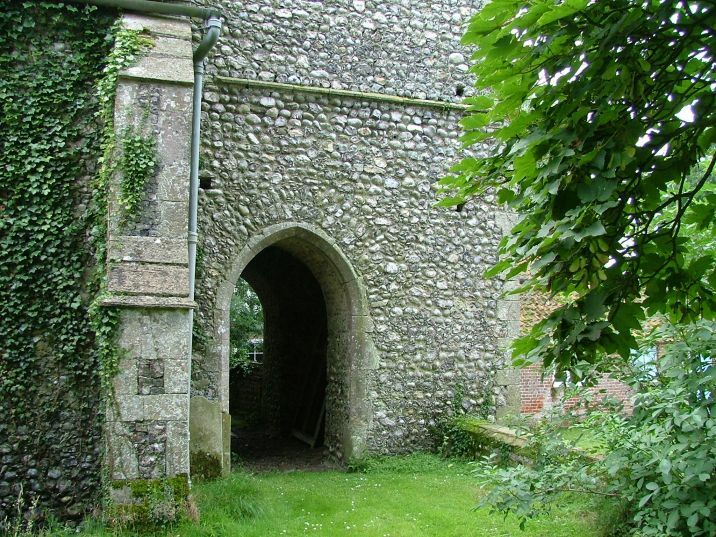 The most interesting feature is at the foot of the tower, for there is a processional way running from north to south, the western face of the tower being hard against the churchyard boundary. The northern side of the chancel is windowless now, but the prospect from the south, away from the village street, is gentle and timeless. On this cloudy day it was a gloomy interior to step into. This is mostly the fault of the Victorian restoration, which ceilured the roof, leaving nothing but a functionless wallplate with fascinating grotesques on it. 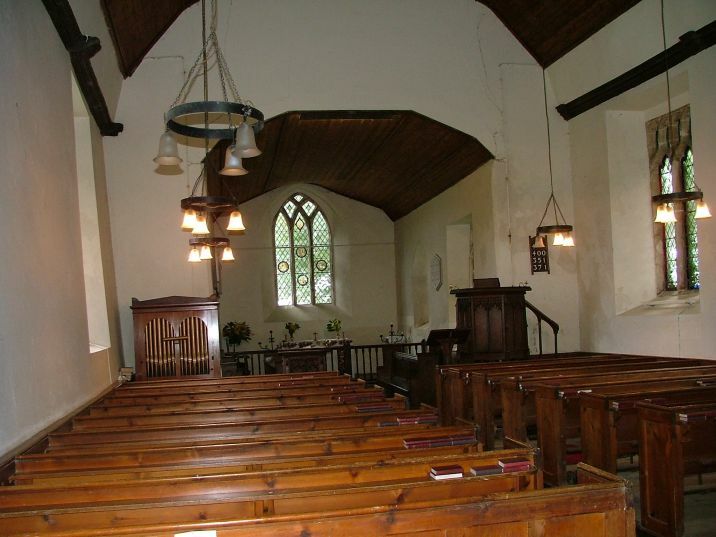 The restoration here was fairly middle-of-the-road; the town church benches must have seemed the very thing in the 1870s, but today they are characterless and dull, out of keeping with the ancient peace outside. How the nave would be improved if they were replaced with modern wooden chairs! 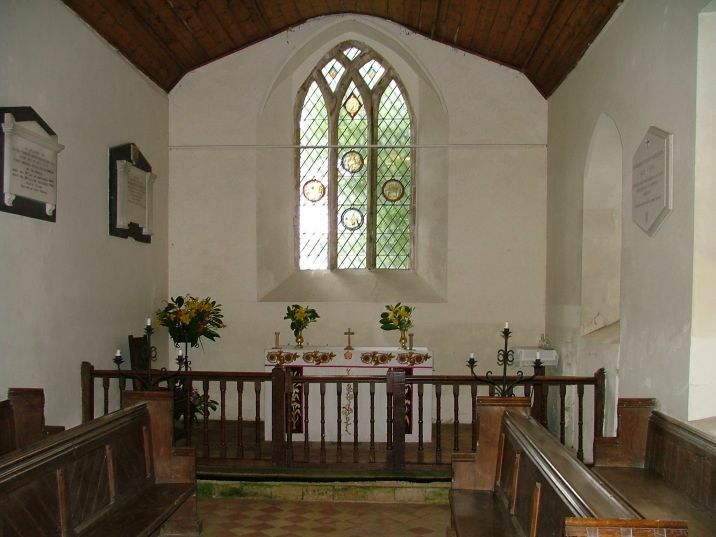 The chancel is much better, very rustic and simple, with a pammented floor and bare furnishings. The flowers made it feel a place at once well-loved and well-used, a delight. 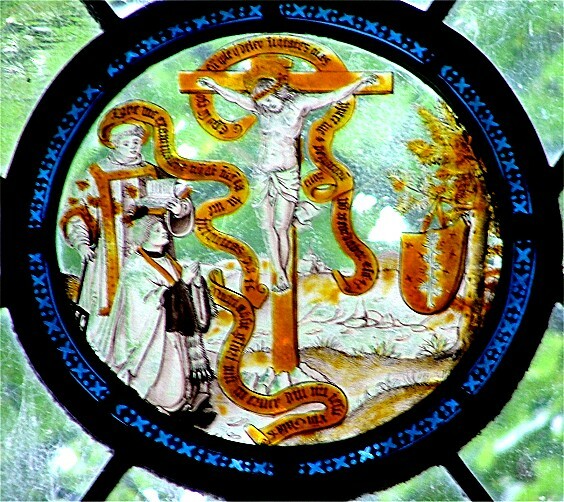 There are roundels of Flemish glass in the east window, set here by the Dennis King workshop in the early 1960s. The best is the central one, a crucifixion scene attended by vestmented figures in the bottom left hand corner. 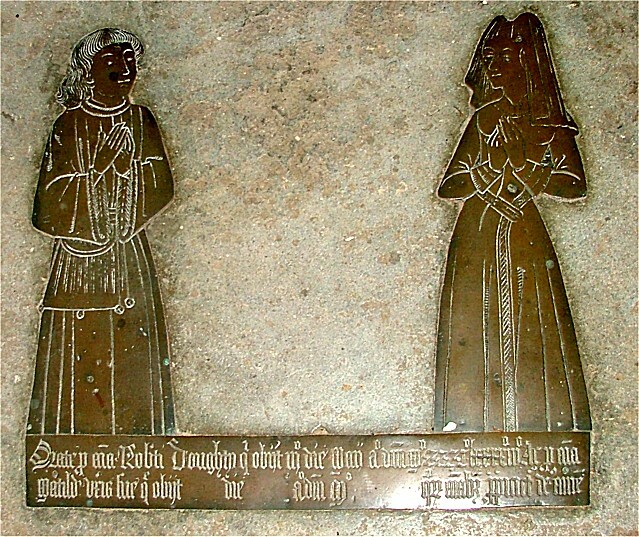 By the south door, hidden under the table, is a fine civilian brass to Robert and Matilda Doughty. 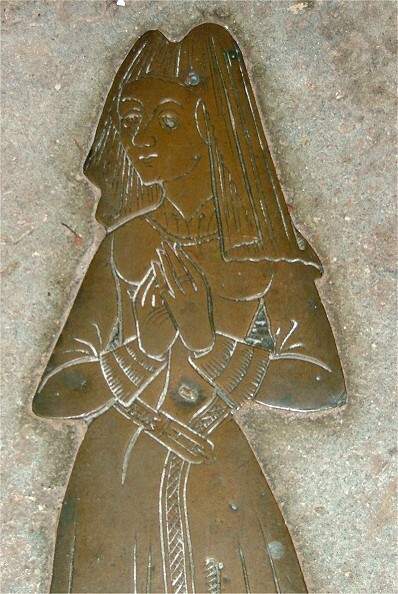 Robert died in 1493, and presumably the brass was put in place before the death of his wife, because the place for her dates has been left blank. This is not as glorious, perhaps, as the brasses at nearby Felbrigg; but it is a good one, and you could easily miss it. 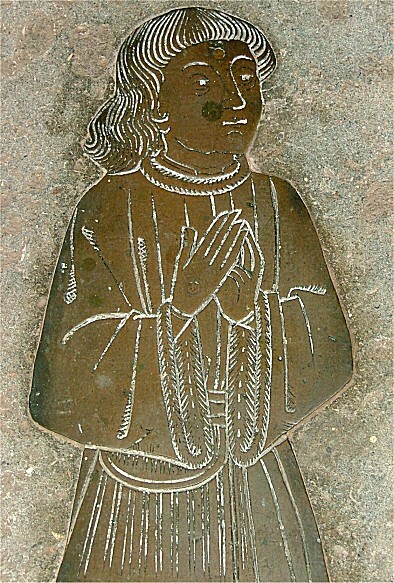 There are also a couple of brass inscriptions that we found under the nave carpet when we were looking for the Doughtys. 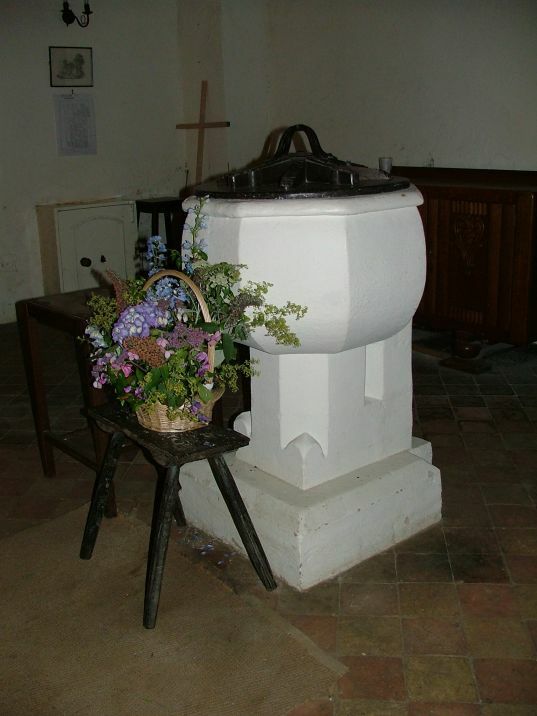 One is directly beside the fine, if over-plastered, Norman tub font, which rather looks as if it was originally designed to stand against a wall or a pillar. A curiosity is welded to the north wall, beside the door. This is the 19th century parish truncheon, a fascinating survival. These objects were symbols of authority rather than implements of aggression, but all the same I couldn't help wondering if it had cracked a few parish heads, and quite what the 18th century parishioners would say if they could come back and see it so fondly displayed. It was time to go. There was something sad about this church; not exactly oppressive, but a feeling that this Victorian interior which had seemed so bright and earnest a century and a half ago had faded. It had seen its congregation shrink, as if they were leaving one by one, leaving only an echoing emptiness, except for services. The patina of the varnish and the tiles had dulled, and the whole place brooded beneath the ceilure. Only the chancel still seemed alive. And there was something else, of course. As I signed the visitors' book, I noticed that several recent visitors mentioned their prayers for April. I thought that this was a lovely thing, that they remembered. I remembered too. 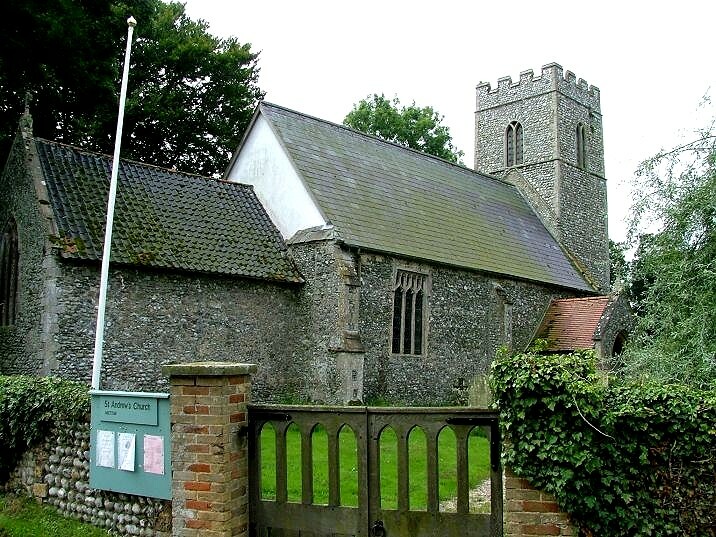 Thirteen year old April Fabb's disappearance on the edge of this tiny village in the spring of 1969 haunted me as a little boy at the time, and still haunts East Anglia today.